Volunteer - Raptor Rehabilitation of Kentucky, Inc.
Raptor Rehab of Kentucky, Incorporated, (RROKI), is an organization devoted to the rehabilitation and care of injured raptors and the education of the public concerning a raptor's place in the ecosystem. As a volunteer with RROKI, you will have opportunities to participate in education presentations, medical treatment of sick or injured raptors, and the care of birds used for educational programs. Raptor Rehab is volunteer based. So volunteers provide the daily care to prepare meals, feed and water, provide check-ups, medical treatment and physical therapy. Every day, no matter the weather outside, we have to clean and maintain cages and crates and interact with the birds. Some volunteers also go to pick up sick and injured birds from outlying areas. •Volunteers must be 18 years old. •You must be willing to commit a minimum of 4 hours a week. •Hours are flexible -mostly weeknights and Friday/Saturday/Sunday mornings. •It's a dirty job. Wear your oldest clothes and shoes. Raptors can be aggressive and very dangerous. The training regimen at RROKI is necessarily strict and thorough to protect all parties involved. Training includes a minimum of 12 sessions lasting 4-5 hours, once a week, depending on previous experience and individual advancement. All volunteers must purchase a training manual, which will help guide you through your new experiences. The more interest you show, the faster you advance! Care of rodents (cleaning cages, feeding, and watering). Maintenance of equipment (cleaning crates and perches, oiling jesses, etc.). General knowledge and specific biographies of education birds. 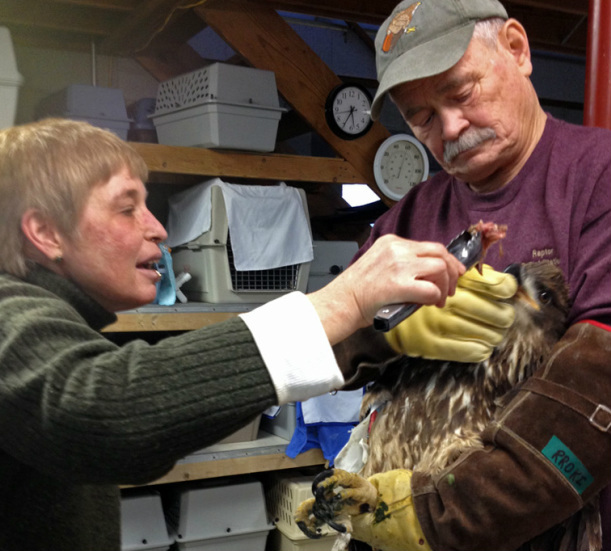 Care of raptors (cleaning areas, feeding, medical treatment and diagnosis). After training is completed, volunteers should be capable of daily care of raptors, as well as the presentation of individual raptors in an educational program. You will be assigned to a regular shift (usually 5 hours), one day a week, which is compatible with your schedule, along with several other experienced volunteers. We count on volunteers to work as scheduled or to find a replacement. All volunteers should attend our monthly meeting on the 3rd Friday of each month at 6:30 p.m., at the Bon Air Library. We hope that you are able to join us in our dedication to raptors, and that you become a part of the future of RROKI!